193 In what was to become one of the most shameful episodes in the political annals of the empire, the death of Pertinax launched a frantic search for an imperial replacement. 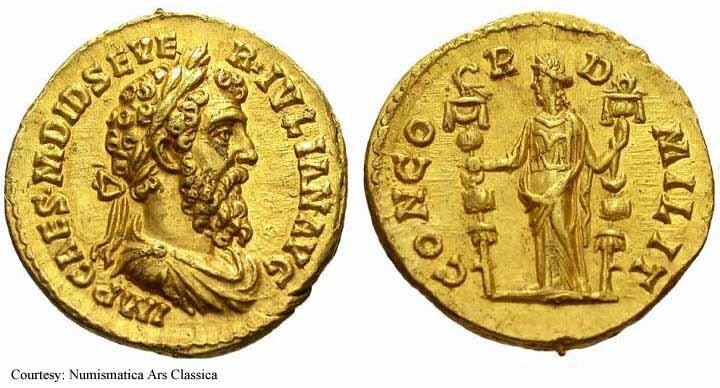 The imperial guard, who held de facto power, decided to "right the wrongs" of Pertinax in a most self-serving manner: by auctioning off the throne! 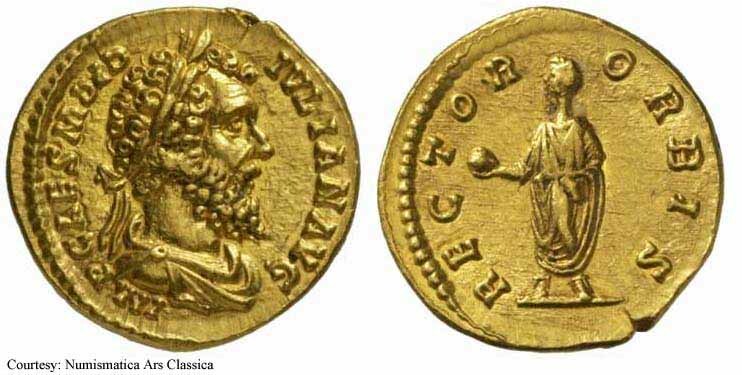 Two of Rome's richest Senators, Didius Julianus and Sulpicianus bid back and forth the donative to be given to each soldier until the sum of about 625 denarii was reached by Julianus. He was at this point declared the winner amid a joyous uproar. A joyous uproar, of course, by the soldiers who managed such a princely sum for themselves. The rest of Rome cowered in angst at what fate may bring them in the near future. Gibbon, the famous Roman historian of the eighteenth century, called it the "most insolent excess of military licence" and recalls that after the initial festivities of the day were over Julianus "...passed a sleepless night; revolving most probably in his mind his own rash folly, the fate of his virtuous predecessor, and the doubtful and dangerous tenure of an empire, which had not been acquired by merit, but purchased by money." And if he did worry he had ample reason to: as soon as news of this travesty reached the various legions scattered about the empire generals were driven to condemn the new emperor and set out to seek the position for themselves, backed by their veteran legions. 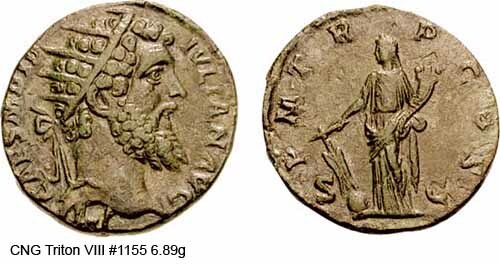 Septimius Severus, the first to reach the capital, quickly deposed and executed Julianus and then went on to defeat the other rival contenders in a bloody and prolonged civil war. RIC 2, BMC 4, C 8 Aureus Obv: IMPCAESMDIDIVLIANAVG - Laureate head right. Rev: PMTRPCOS - Fortuna standing left, holding rudder on globe and cornucopia. March - May 193 (Rome). $16,000 1/13/03. 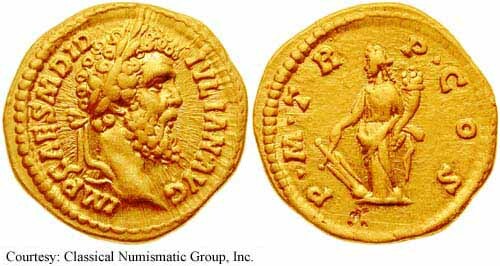 RIC 3, C 14 Aureus Obv: IMPCAESMDIDIVLIANAVG - Laureate head right. Rev: RECTORORBIS - Didius Julianus standing left, holding globe. March - May 193 (Rome). RIC 5, BMC 9, C 1 Aureus Obv: IMPCAESMDIDSEVERIVLIANAVG - Laureate, draped and cuirassed bust right. Rev: CONCORDMILIT - Concordia standing, facing, holding standard in each hand. March - May 193 (Rome). 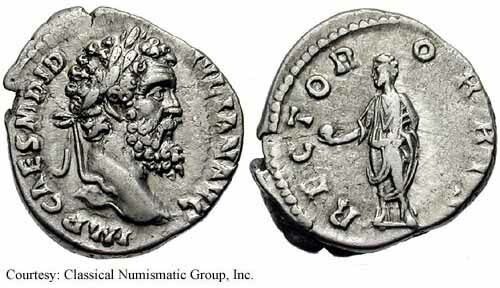 RIC 1, BMC 2, C 2 Denarius Obv: IMPCAESMDIDIVLIANAVG - Laureate head right. Rev: CONCORDIAMILIT - Concordia standing, facing, holding standard in each hand. March - May 193 (Rome). $1,750 1/13/03. 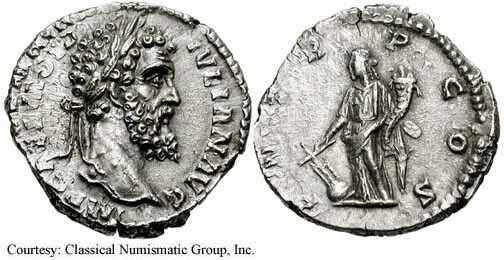 RIC 2, BMC 6 Denarius Obv: IMPCAESMDIDIVLIANAVG - Laureate head right. Rev: PMTRPCOS - Fortuna standing left, holding rudder on globe and cornucopia. March - May 193 (Rome). 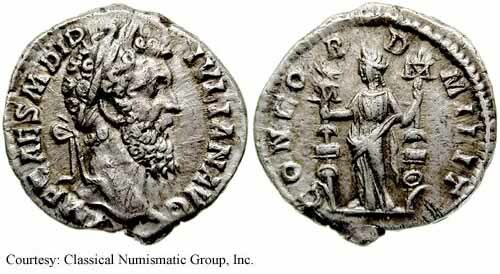 RIC 3, C 15 Denarius Obv: IMPCAESMDIDIVLIANAVG - Laureate head right. Rev: RECTORORBIS - Didius Julianus standing left, holding globe. March - May 193 (Rome). $1,750 5/21/03. 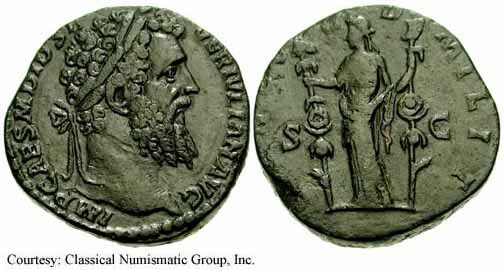 RIC 14, BMC 20, C 3 Sestertius Obv: IMPCAESMDIDSEVERIVLIANAVG - Laureate head right. Rev: CONCORDIAMILIT - Concordia standing, facing, holding standard in each hand; S C across fields. March - May 193 (Rome). 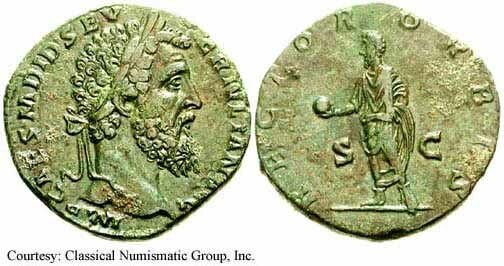 RIC 15, BMC 25, C 12 Sestertius Obv: IMPCAESMDIDSEVERIVLIANAVG - Laureate head right. 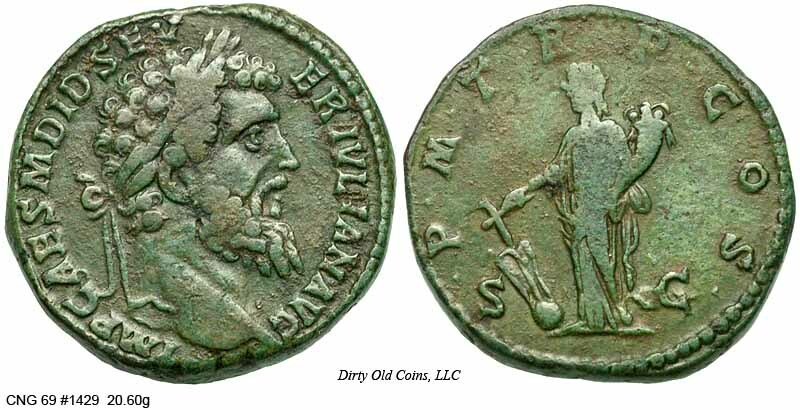 RIC 16, C 17 Sestertius Obv: IMPCAESMDIDSEVERIVLIANAVG - Laureate head right. RIC 12, C 13 Dupondius Obv: IMPCAESMDIDIVLIANAVG - Radiate head right. Rev: PMTRPCOS - Fortuna standing left, holding rudder on globe and cornucopia. March - May 193 (Rome). $1,800 1/11/05.